Ever look in the fridge and find jars with half a roasted red pepper or three olives or a teaspoon of capers? How about finding half an onion and three wilting stalks of celery in the crisper? This happens all the time at Casa Minx. Every once in a while, I have to concoct something that uses these odd bits and bobs. I empty the fridge while filling the recycle bin. The fridge isn't the only storehouse of partially-full packages. The cupboard revealed a bag with three dried apricots in it and another with a handful of sundried tomatoes. There was also approximately 1/2 of a home-made preserved lemon in the fridge. Thus armed with a selection of fruits and vegetables, I set to work, basically chopping everything and tossing it into a pot with a bit of olive oil. Hey - no matter what the fancy French chefs would have you believe, saucemaking isn't rocket science. A couple of the items - the olives, the lemons - were salty and tangy, so I added a bit of brown sugar for balance. But if you have a couple of tablespoons of hot pepper or even raspberry jelly languishing in the fridge, that would work just as well. I popped some chicken thighs into the sauce, because I always have some in the freezer, but you can cook the sauce separately and serve it over fish (swordfish would be terrific). Or replace the chicken stock with veg stock and use it as a vegetarian sauce over some chunky, frilly pasta like campanelle or farfalle. 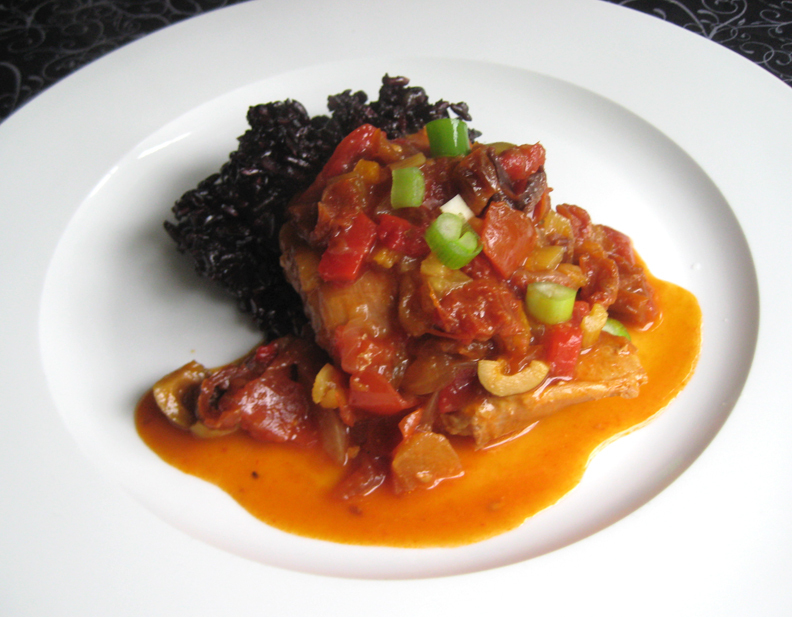 The sweet and sour + celery flavors are very reminiscent of caponata, a Sicilian eggplant dish with a distinct celery flavor, so if you cooked the sauce down enough (or add less stock), you could even serve it as a side dish. Put onion and celery in a large skillet with about a tablespoon of olive oil and a pinch of salt. Cook over medium heat until onion is translucent. Stir in the garlic and cook for about a minute before adding the tomato, lemon, sundried tomatoes, olives, and apricots. Mix well, then stir in the tomato paste, chicken stock, brown sugar, and paprika. Bring mixture to a boil, then add the chicken thighs. Lower heat to a simmer and cover pan. Simmer for 45 minutes to an hour, until sauce has reduced and thickened and chicken is very tender.